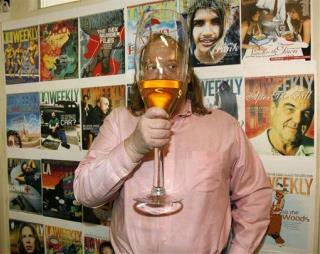 (Newser) – Jonathan Gold was a restaurant critic, the only one to win a Pulitzer Prize for his efforts, and he was 57 when pancreatic cancer ended his life on Saturday—just a few weeks after his diagnosis. He was also a gentle giant in an industry that has now lost two of late; as the New York Times puts it, his "curious, far-ranging, relentless explorations of his native Los Angeles helped his readers understand dozens of cuisines and helped the city understand itself." Gold waxed poetic about haute cuisine and taco trucks alike, but notes the Times, he "was in his element, when he championed small, family-run establishments where publicists and wine lists were unheard-of and English was often a second language." Gold was the Los Angeles Times critic since 2012; before that, he wrote decades' worth of reviews for the likes of LA Weekly and Gourmet, though LA Eater notes his start as a music reviewer helped inform his "lyrical" writing. It all began with Julia Childs. I love all the new cuisines. I still have her cookbook and use it. The orange torte is huge and one of the best cakes I have ever had. Pancreatic cancer is a horrible one.